Are commercial pet foods safe? Pet foods – in particular dog foods – have been a real bone of contention lately. Yes, I did mean to do that. Hopefully the quality of this post will improve. We have had a range of animal food toxicity problems over the years from Chinese meat jerky treats causing kidney failure, thiamine lacking foods causing neurological problems, to the current episode of the respected Advance Dermcare dry food causing megasophagus (an eventually fatal condition in many cases). As a result many people are feeling very wary about commercial pet food safety and a new movement has sprung up demanding increased label disclosure regulations for the pet food industry. The fact that Australian pet food industry is entirely self-regulated is a big part of today’s problems. Advance Dermcare was subjected to a prompt recall as soon as the company had clear evidence of a connection between their product and the onset of megasophagus. However it is very significant that this recall was entirely up to the company – there was no regulated requirement for it. Many other food importers and manufacturers have not behaved so ethically. Many companies have quietly played down toxicity problems as a public recall hurts sales and consumer confidence. Robust Government reporting regulations could address this. If this concerns you as much as it concerns me, you might like to add your signature to this petition. What can I do to avoid this happening to my pets? Try to always buy Australian made products. If not Australian, then only well-known reputable brands. Provide variety. Don’t just feed one type of commercial food without change for more than a few days. The next important rule is so very basic, yet it is ignored by many of us (myself included!). Freshness! Many of the health problems we hear less about relate to contamination and spoilage. Applaws dog food has recently been found to be suffering mould spoilage and plastic elements ending up in the biscuit product. Applaws had NOT issued a recall of the product when this post was written. Visually check every serving of commercial food you give your pets. Look closely – don’t just trust it to be fine. Follow these 3 basic rules and you will significantly lower the risk of feeding anything problematic to your pets. What foods does Animal Happiness recommend? Here at Animal Happiness Vets we have put a lot of thought into the choice of foods we stock. Obviously we need to stock a range of prescription diets for specific medical conditions. 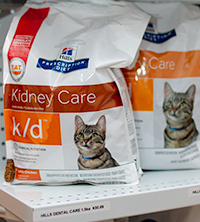 For these we mostly carry the Hills Prescription Diet range, as well as the Royal Canin range if needed. Of course we can order in any of these very specific diets for your needs. Please note that the term “prescription diets” is a bit misleading. These foods do NOT require a veterinary prescription like an S4 drug. They are over-the-counter products like any other pet food. Obviously choosing to feed one of these very specifically formulated foods without veterinary guidance is not recommended – but it’s not illegal. 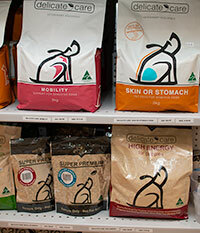 For healthy pets I recommend, and use personally, a dry biscuit made here in Western Australia – Delicate Care. This comes in a range including High, Normal and Lite energy varieties – catering to growing/working dogs, adult dogs and senior dogs respectively. The range also includes two very popular varieties that I consider “Prescription diets” even though they are perfectly healthy to feed any dog. These are “Sensitive skin and stomach” and “Mobility“. I consistently see excellent results with dogs where these diets are indicated. Dogs suffering osteoarthritis do particularly well on the Mobility variety. The newest addition to our food range I am actually very excited about. One thing entirely missing in the Australian pet food market until now has been free-range options. 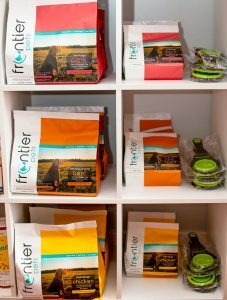 Anybody who is vegan/vegetarian or simply cares about food animal welfare will be delighted to know we now carry the exceptional Frontier Pets freeze-dried food range. Freeze-dried foods carry all the advantages of feeding a fresh home-made dog food without any of the risks. Being freeze-dried these foods last exceptionally well without the need for thiamine-destroying preservatives. Coming in beef, chicken and pork varieties – all are sourced from genuine free-range producers. The non-meat components are also all entirely organic. With less than 2% carbohydrates and made only from human grade ingredients these diets are simply the most healthy and ethical options available today. And most importantly – dogs just love the stuff! What are you feeding your dogs? Let us know what is working for you! Post in the comments below what you are feeding your pets and why. We all have much to learn! Hi Gary we feed Lucy (now 3 years – extremely healthy with no skin problems- beautiful thick coat and lovely clean teeth) daily- am a handful of dry food and pm a couple of handfuls of either Supercoat or Optimal and about 8 cm (cut up) of Natures Goodness -grain free roll. She also has a raw soup beef bone daily as well……………..
Are you feeding your rabbit healthy food?